This spacious park is named for St. Nicholas of Myra. 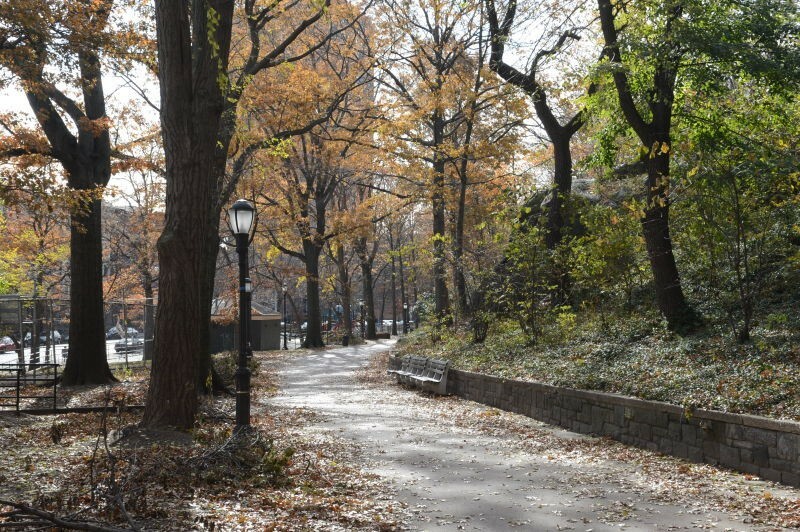 It is located at the intersection of St. Nicholas Avenue, 127th Street, St. Nicholas Terrace and 141st Street, bordering the Manhattan neighborhoods of Hamilton Heights, Manhattanville, and Harlem. Originally settled by Dutch farmers in the late 1600s, after the American Revolution (1775-1783) the neighborhood’s agricultural yield began to wane. Many residents moved to southern Manhattan’s newly industrialized areas. In the 1880s, the area developed quickly as the elevated trains and tenement houses were constructed in Harlem, Hamilton Heights and Manhattanville. The City acquired some of the land for St. Nicholas Park by condemnation for the construction of the Old Croton Aqueduct in 1885-86. New York State laws of 1894 and 1895 authorized the creation of a public park instead, and it was called St. Nicholas Park. The name for the park was taken from the adjacent Harlem streets, St. Nicholas Terrace (to the west) and St. Nicholas Avenue (to the east). These streets honor New Amsterdam’s patron saint, whose image adorned the masthead of the New Netherland that brought the first Dutch colonists to these shores. St. Nicholas of Myra is also known as the patron saint of children, sailors, bankers, pawnbrokers, travelers, and captives–as well as the inspiration for Father Christmas or Santa Claus. Legend claims that he gave his considerable inheritance to charity and often made secret and anonymous gifts to the desperately needy. He served as bishop of Myra in Asia Minor in the 4th century where he was venerated even before his death as a man of exceptional holiness. St. Nicholas’ relics are enshrined in the Italian town of Bari. Additional property for the nascent park was assembled in 1900-1906, and construction began in 1906. 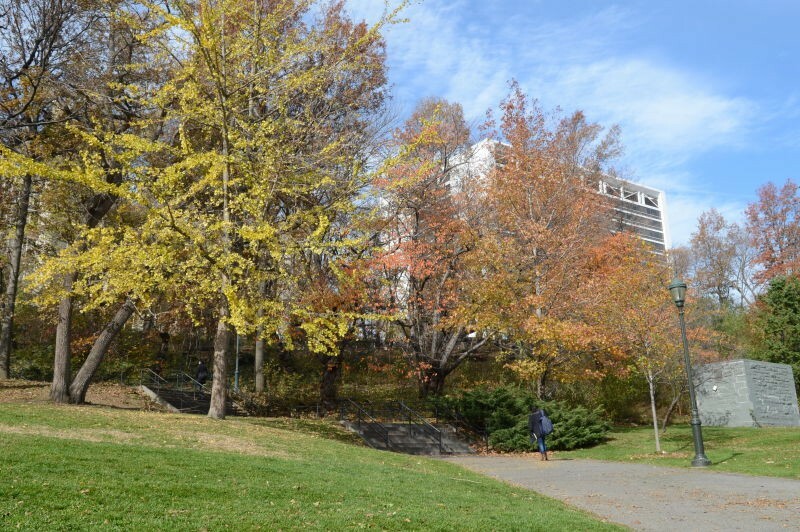 Like Harlem’s other “ribbon parks,” St. Nicholas was built on a rugged mass of rock, following the steep and irregular topography of northern Manhattan. Landscape architect and Parks Commissioner Samuel Parsons Jr. (1844-1920) was responsible for the design of the rustic park, of which he said a “dominant note must be followed with a harmonious treatment, a high hill made higher, a rugged slope more rugged, a deep valley made deeper, thus invariably following nature’s lead.” The development of the park and the completion of the elevated rapid transit line made this area of Harlem a fashionable residential district at the turn of the century. In 1909 Parks acquired an adjacent parcel that extended the southern boundary of the park from W. 130th Street to W. 128th Street. This property contained the area known as “The Point of Rocks,” where General George Washington had positioned himself during the Battle of Harlem Heights in 1776. Parks opened a playground near the West 129th Street entrance in 1931; and the new facility included swings, a basketball court, and a garden where farm products were grown for educational purposes. Thirty years later, Parks and the Board of Education made arrangements for a new jointly operated playground on this site. The 129th Street Playground opened in 1965, and P.S. 129 opened in 1970 on nearby property held by the City College of New York. P.S. 129 is also known as the John H. Finley Campus School in memory of City College’s third president, who served from 1903-13. Since 1995, Harlem community members and City College (under the leadership of Director of Community Development Jim Bawek) joined together to “Take Back St. Nicholas Park.” Neighborhood groups participating in the initiative to make the park a cleaner and safer place included the Hamilton Heights Homeowners Association, A. Philip Randolph High School, Thurgood Marshall School, the Community Helpers, and the Harlem YMCA. The 129th Street Playground benefited from their efforts and from a $602,000 capital renovation funded by City Council Member Stanley E. Michels in 1996. The playground benefited from the installation of new play equipment, color seal-coated basketball courts, improved safety surfacing, a frog spray shower, a drinking fountain, World’s Fair benches, and a community bulletin board. The handball courts were also renovated. New pavement and curbs, a steel picket fence with lockable gates, and improved water supply and drainage systems improved the overall appearance of the park.